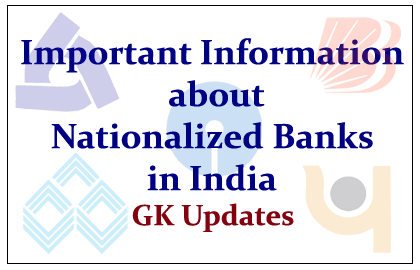 List of Important Information about the National Banks in India were given here below, which is more helpful to attend the General Awareness Question in the Ban Po and Clerk Exams. Allahabad Bankis the oldest bank to startJoint Stock in India. Central Bank of India is the first Indian bank to befully owned by Indians. Bank of India is thefirst bank to open its branch outside the India (at London, 1946). Bank of Baroda has thelargest number of branches in the abroad. ICICI Bank is thelargest Private Sector Bank in India to have Rs. One Trillion Market value. It is the first Universal Bank in India. Punjab National Bank is the First Indian Bank to haveunlimited liability. Union Bank of India wasinaugurated by Mahatma Gandhi in 1919. Canara Bank has receivedISO 9002 certificate to its one of the branch. SBIis thelargest commercial Bank in India, and Government holds51% of Shares of the SBI. Indian Postal Department has launched a Stamp in the name of theCentral Bank of Indiacelebrating its100 years in 2011.